Getorix has come to say goodbye. He's leaving on the journey to fulfill his vow to return his father's signet to his home village in Jutland and to make a sacrifice in his honor. In the three months since Getorix escaped slavery in the Lutatius household, he and Lucius have continued to meet on the Campus Martius and have truly become friends. Getorix meets Lucius, Keltus and Brosch at the monument to the Roman victory. Suddenly figures, painted and wearing horned helmets like mythical Celtic warriors, spring from behind the monument, yelling war cries and brandishing torches. When they're gone, so is Lucius. Getorix, Keltus and Brosch must get him back. 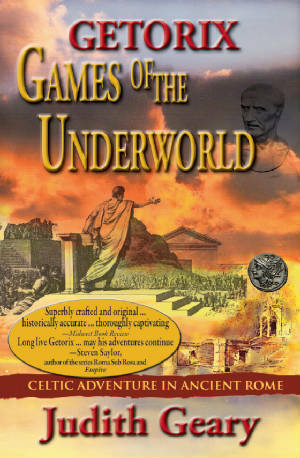 The Roman Consul Marius may be involved, and Getorix is accused, so they can't trust the authorities. Saturninus and Glaucia, two of Rome's most notorius demogogues, offer help. But their help may come at too high a price. Can Getorix and his friends survive the political intrigue of this pivotal point in Roman history?